If you've been following SailFarLiveFree.com lately, you know that Ted Brewer has graciously been sharing some very interesting and educational content in response to my question asking him to name some of his favorite personal designs. What follows below is what Ted shared with me about his Goderich 35 design (often also called the Huromic 35). If you need to catch up on Ted's previous responses in this blog series, check here and here. 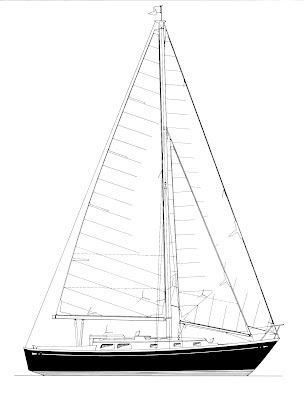 The Goderich 35 is a rather straight forward, double headsail cruising sloop (some will call it a cutter), and may seem a strange choice to be one of my three favorite designs, but when you consider that two of them circumnavigated the globe the hard way, below the Cape of Good Hope, Australia and Cape Horn, you may begin to understand my reasons. But more about that later. By 1976 I'd had a fair bit of experience in metal yachts including several 45-55' round bilged hulls when I was with Luders, plus the 56' ketch Mystic in the late '60s, and the 40' double chine schooner Corten. 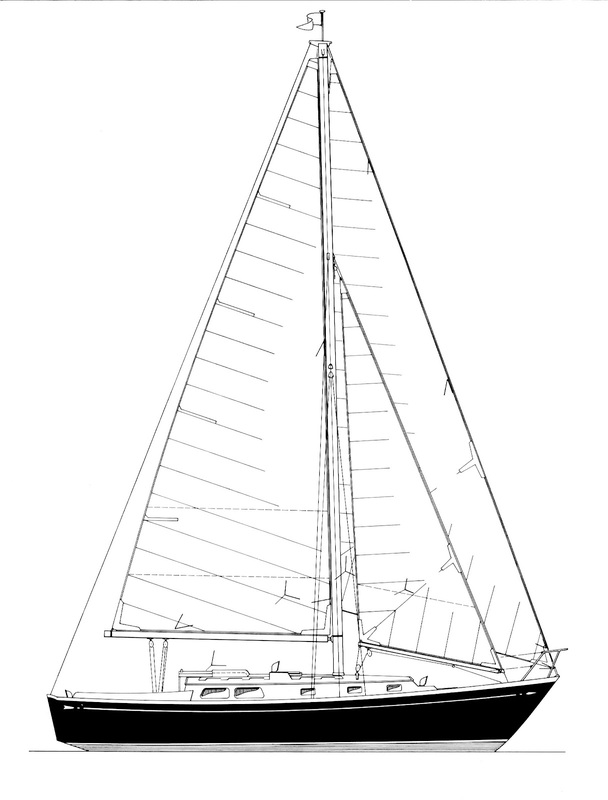 So, when we were commissioned by Huromic Metal Industries of Goderich, Ontario to design a semi-production 35' blue water sloop, I tried to think of some way to make it unique. I knew the builder had little experience in metal boat building and would not be able to handle a standard round bilge design. And then it hit me; it should be a round bilge design that could be built in metal by relatively inexperienced builders, even amateurs. 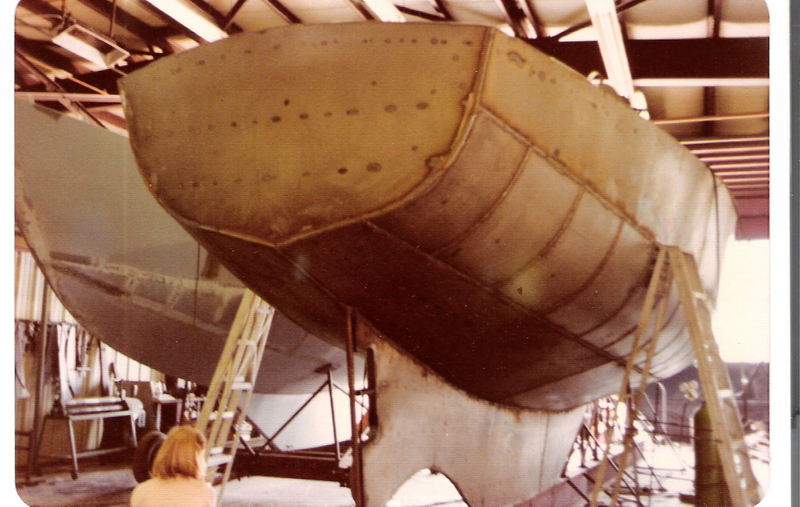 My first idea was to plate the boat with plank-like strips of metal, but the amount of weld and the distortion that such a system would entail ruled it out. Then I considered plating the topsides and bottom with regular sheet metal, leaving only the bilge area to be 'planked'. Essentially, it would be a single chine, vee bottom hull with a large radius shape inserted in place of the hard chine. And, once I discarded that, also because of the weld problems, my fevered brain came up with the idea of rolling a sheet of metal to a large radius, cutting it off in sections, and welding those between the flatter sheet metal topsides and bottom. And that was it; to the best of my knowledge the very first "radius bilge" metal hull ever! Or "radius chine" as some term it; same thing! 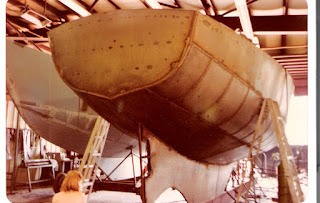 In truth, I complicated the 35's construction slightly by changing the bilge radius gradually, from 30" in the forward sections to 26" radius aft, in an effort to improve appearance, but it did not seem to matter. Hulls have been built by professional metal boat builders, regular metal fabricating shops, and complete amateurs and I've never heard of any major problems. The framing was simplified by using closely spaced, flat bar, longitudinal stringers on widely spaced athwartship frames and the resultant hull turned out to be quite fair without the use of the thick layer of the epoxy/micorballoon "mud" that seemed so necessary to fair up the earlier athwartship framed, round bilge hulls. 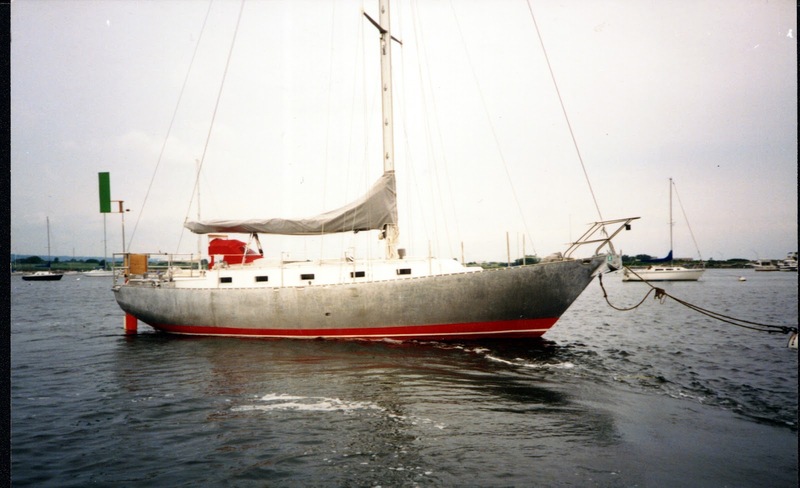 Huromic launched the first Goderich 35 in 1977 and the boats were well received, with steady orders coming in over the next few years, including several 35s modified to 37 foot with an extended stern overhang and offered with a ketch rig option. The success of the radius bilge construction system encouraged me to use it in three dozen following designs in both steel and aluminum, from the 30' Bulldog sloop to the 60' three masted schooner Arden. Even the old Corten schooner design was refurbished with a radius bilge option, plus cutter or ketch rigs to suit other client's preferences, and one of these cutters made a very successful multi-year circumnavigation also. Still, the reason that the Goderich 35 means so much to me is because of the voyages of two wonderful sailors; Marvin Creamer and Edwin Arnold. Marvin was a geography professor in New Jersey and believed that it was possible to circumnavigate the globe the same way the ancients crossed the oceans, without the use of navigation instruments of any kind. 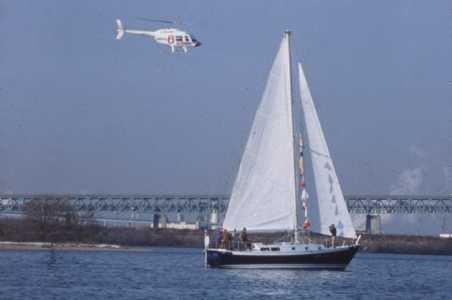 He had made shorter voyages to test his theory and, to prove his point, Marvin outfitted his Goderich 35, Globe Star, organized a crew, and set off from Cape May, New Jersey on December 21, 1982. The boat did have a sextant, compass, etc. aboard, but only for an emergency and they were in a sealed compartment, which was still sealed at the end of the voyage. There was no clock aboard, not even a wristwatch, and a simple hourglass determined the time for the change of watch. Marvin Creamer navigated solely by his knowledge of the stars, the ocean currents and the prevailing winds. That was not the end of the 35's remarkable voyages though. Some years later Ed Arnold asked me to convert the Goderich 35 to aluminum construction and a hull was built in Washington State. Ed had it shipped east, where he completed the bare hull, christened her Nomad, and he and his wife Mary sailed off to Europe for a few years. 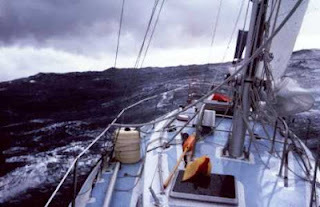 Some time later they headed home by way of the Azores, where Ed said he really wanted to round Cape Horn. His wife, wisely, opted out and Ed headed south from the Azores, solo, to successfully weather the stormy cape and then sail north, all the way north, to Sitka, Alaska. be painted above the waterline as it simply turns grey and will not corrode. That convinced him that he really wanted to do a solo circumnavigation so, on October 1, 2001, Ed headed out of Sitka and pointed Nomad's bow south to Cape Horn once more. He had planned to make the voyage non-stop but an argument with a bergy bit in the South Atlantic forced him to put in to the Royal Cape Yacht Club in Cape Town for repairs. Ed stopped again in Adelaide, Australia for repairs to his radar but, after that, it was non-stop to Sitka, where he arrived on September 6, 2002, a very remarkable 11 months after setting out, despite a month lost for the repairs. Blue water voyagers and others interested in Nomad's course, daily runs, etc. can find plenty by Googling "Ed Arnold circumnavigation". And that is why the Goderich/Huromic 35 is one of my favorite designs. 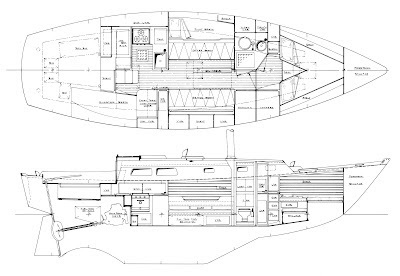 She pioneered a new system of metal hull construction and was the forerunner of many more radius bilge designs. Plus, two of the 35s, Globe Star and Nomad made truly historical voyages, and I was able to meet two superb sailors, Marvin Creamer and Ed Arnold. 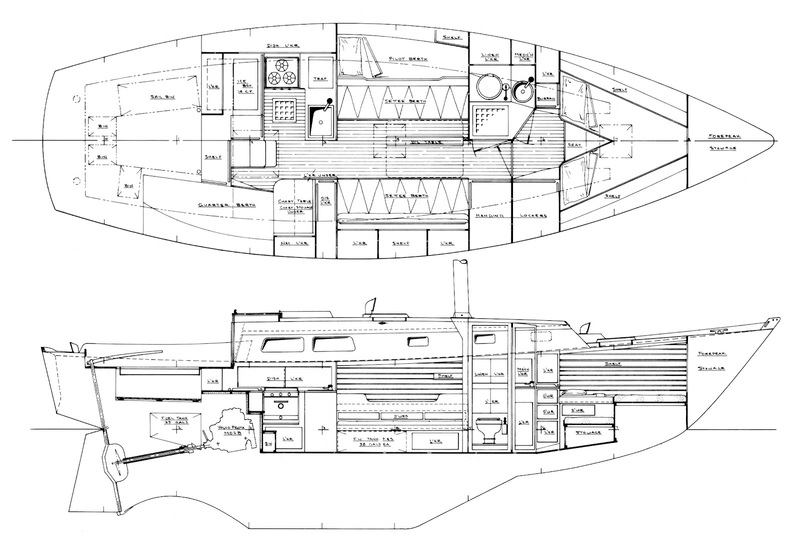 For more perspective from Ted Brewer, check out his book: Understanding Boat Design. How does this boat sail? What are the things you need to pay attention to on a steel boat as apposed to a FG boat? Ted, I know the couple (Leslie and Carol-Ann Sike)who did the first yacht trip in a Goderich 40. I know your partner at that time Bob Wallstrom had a hand in that design, or you had a hand in his, but how much did the 35 influence the 40? I know a fellow (Matt Phillips) who's owned a Goderich 40 ketch for 25 years. It's in great shape and is an excellent boat in a blow. Rhys - I'll make sure Ted sees your comments. Thanks for reading! Ted I was the forman at Huromic Metal Industries when the first Goderich 35 was manufactured. Just came across Bill Smith's comment. I have owned a 1979 Goderich 35 made at Huromic Metal for over a decade. It would be very interesting to hear Bill's experiences and insight into the building process.